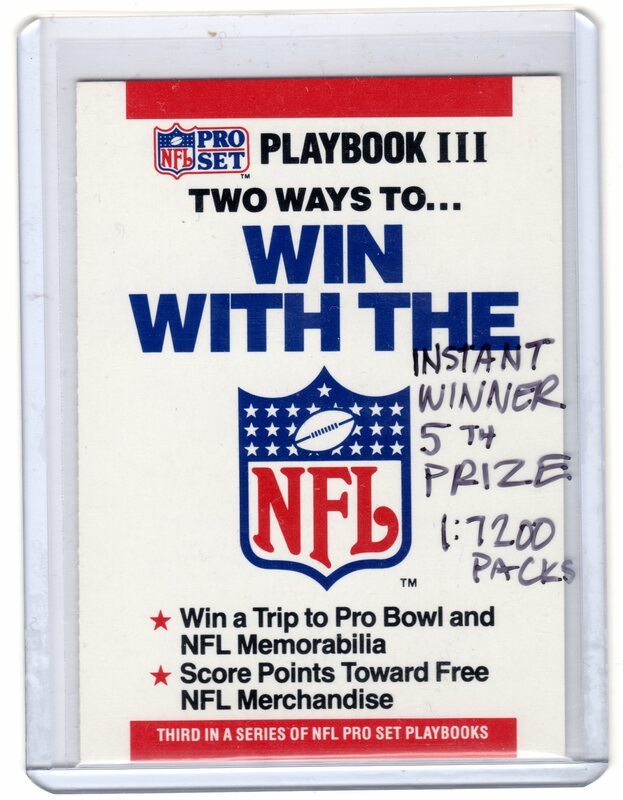 1990 Pro Set Playbook Points Instant Winner 1:10 Cases! I recently completed sorting through my 5000ct box of 1990 Pro Set series one inserts: those folded booklets that come with two scratch-off areas, one for “points” redeemable through the Gazette and one for the chance to instantly win one of several prizes ranging from a trip to the Pro Bowl to a Collector’s Game Program. While hunting and successfully discovering several variations, I also stumbled upon an actual, unscratched “5th Prize” instant winner. Holding up each copy from the monster box to a desk lamp, I was able to see what was printed beneath the silver scratch-off ink. An amazing feat, considering the stated odds for this prize was 1:7200 packs! With a stated print run of 10,000 “5th Prize” instant winner cards, that places production equal to the pack-issued Lombardi holograms! And when you consider how many were mailed in (maybe few, maybe most) and how often these find their way into the trash, this becomes one of the rarest items among the 1990 Pro Set issue. 1990 Topps Jeff King “No White On Back” and Why it Doesn’t Belong in the Big Books! For less than a decade now, the Sports Collectors Digest has listed a major variation within the 1990 Topps set. Just recently, it’s catalog price has jumped up near Frank Thomas NNOF range, funny, considering zero copies have ever come up for sale! In fact, only one or two copies have been confirmed to even exist. Rare right? 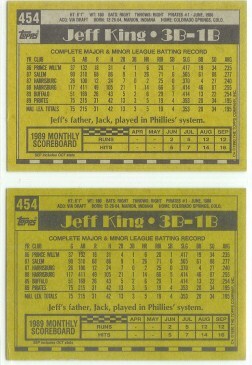 I’m talking about card number 454 Jeff King. Yeah, the former #1 overall pick of the Pittsburgh Pirates and later, Kansas City Royals fame. Jeff’s card can be found with a solid, yellow and black cardback, meaning the cardboard colored areas (bio, border design, etc) typical on the reverses of 1990 Topps are inked over in yellow. Below is the only-known pic out there (as of today!) and the only confirmed copy I know of, however, Bob Lemke of SCD stands by them having recieved more than one submitted to them while editor of the big book. This card, rather it’s catalog-worthy status is irksome to say the least. Collectors, especially those with error and variation focused collections as well as the powers-that-be of the industry, Beckett and SCD, have long held the “rule” that most printing flaws, especially ink-run types, are not considered true variations. This rule of course, has it’s many, many exceptions (Frank Thomas NNOF or 1986 Topps Roger Clemens “Blue Streak” for fresh examples), which is frustrating enough because by cataloging these entries as variations, they become must-have for the completists out there. These books lend a lot of legitimacy to which variations they decide to recognize. A Hughes on Will the owner of the 1991 Donruss Andy Hawkins BC-12A please stand up? Salvatore Briganti on 1990 Pro Set Playbook Points Instant Winner 1:10 Cases! Dylan on 1988 Topps Baseball: Loaded with errors and even some rare stuff. Brady on 1988 Topps Baseball: Loaded with errors and even some rare stuff. Cardsrus on 1990 Topps Jeff King “No White On Back” and Why it Doesn’t Belong in the Big Books!